Happy 43rd Pat.....so glad we had the opportunity to get away this week....it was wonderful! We have a special little family celebration planned for today....including some of your favorite foods.........french toast should start the day off right! 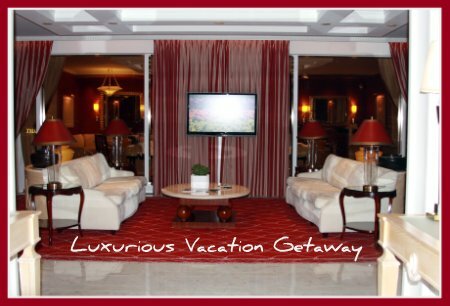 Luxurious doesn't even begin to describe this place.....we had a terrific trip! I could have just stayed in our hotel room for four days.....I have to say that it was the most glamorous hotel room I have ever stayed in......a special thanks to my boss for the beautiful upgrade!! The level of service in this place was spectacular and everyone was so friendly and willing to accommodate. There were so many restaurant choices within our hotel that we only were able to eat at about half of them. I also really wanted to see the show that was playing at our hotel....Le Reve. It looks very cool, most of it is performed under water. The nights that we were able to go, the show was not playing, it started back up again the day we left, so we will have to do that next year when we go back. What a town.....you definitely feel the vibe when you get off the plane....lots of hustle and bustle! We had some of the most incredible meals.....even our breakfasts were awesome....the attention to detail was amazing. I would have to say that my favorite meal was at Eme.rils Fish House with the Chef's Tasting Menu......that was definitely a meal to remember....the wine alone was fantastic! Right now I feel like a slug and will be in need of some extra workout time this week.....the clothes are feeling a little tight to say the least. The spa treatments were unbelievable.....I have had my fair share of massages, but the girl I had for my massage on Tuesday was hands down the best massage therapist that ever laid hands on me. I actually requested her for my massage again on Thursday.....she was even better the second time around! All in all, it was a trip that we will never forget......if you find yourself in Las Vegas, you definitely need to check out the Wynn...it will not disappoint. They are actually a couple months away from opening a new hotel within their hotel.....this is a common thing in Vegas......they are about to open Encore.....it is supposed to be even better that where we stayed.....I have a hard time believing it could get any better, but I guess they need to keep raising the bar. So now, after complaining about the clothes feeling tight,......we are going to have a food filled day.....like any of us really need a piece of birthday cake! I love massages.I got twice a month and have found they have really helped my neck and upper shoulder aches (from my migraines). Welcome home and love the pictures! Happy Birthday, Pat! It sounds like Lisa has a special day planned for you! Forget the girls trip! Cory and I will meet you in Vegas next year! We haven't been to Vegas since 2001(our honeymoon)! PS - thanks for the comment on my 3 words... I'm just hoping they can give me some xanax before hand! The trip was definitely specatular! Everybody needs some cake and ice cream! Have a great birthday Pat! Sounds like you guys are ready to go back lol but than again who wouldn't be!!! 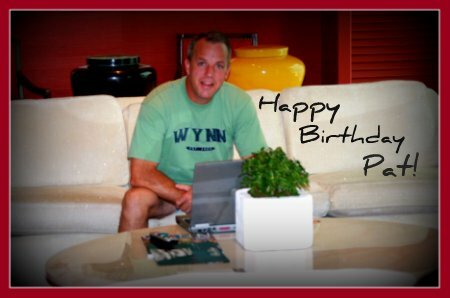 Hope you are having a great day and Pat is having a wonderful birthday!!! I have only been there once.. that was to get married.. and it was WONDERFUL.. Please wish Pat a Very Happy Birthday!!! What a way to celebrate. I have to say you and Pat know how to do it right. Happy Birthday! Sounds like you are having a wonderful time! Happy bday to Pat! We went to NYC for Andy's bday in April, we had both never been and there we were at the top of the Empire States Building on his bday night, pretty cool. Although I'd much rather Vegas baby! Glad you had a wonderful trip. Staying Cool At The Pool!